I don’t see how it would hurt. I used to do some karting when I was iRacing originally and both helped each other. Partcialuly with left foot braking. I agree with Gator on the left foot braking. The SIM is a great place to develop this skill. I have been working on it for a couple of weeks now and I feel very confident the practice will shorten my learning curve in the car. This years first track weekend 29th-31st at UMC will tell. So, I have my new 'puter connected to my old rig with the Oculus. HOLY CRAP! The commercial oculus is sick. It did make ME sick at the beginning, but I am good now. Been doing skippy races to get my SR back in line, which total about 30 minutes. My real boss says I look pale when I come upstairs from the basement after using the rift. Wouldn't doubt it! My current rig is very limiting without a load cell brake (old G27 wheel/pedal). Also, it flexes ALOT. I have a Playseat, and it is horrible design, with the wheel attached to a pole that runs right down the middle. Even with extra thick wool socks, a decent amount of time causes my left foot to get sore because I am applying the brake at an angle. #firstworldsimproblems Sort of glad I did not burden Matt with my old stuff. That said, I ordered a pile of parts from Sim Lab tonight (P1 cockpit, front mount, keyboard tray, mouse tray, triple monitor stand, extra fourth monitor add on, etc...). I also found a barely used Fanatec CSW + McLaren wheel combo from a guy on the iRacing forums; super nice retired d00der in california. The last pieces I need are some pedals and a seat. For the seat, I might scoot out to OGRacing tomorrow afternoon to try out some seats that work for wider people ( ). 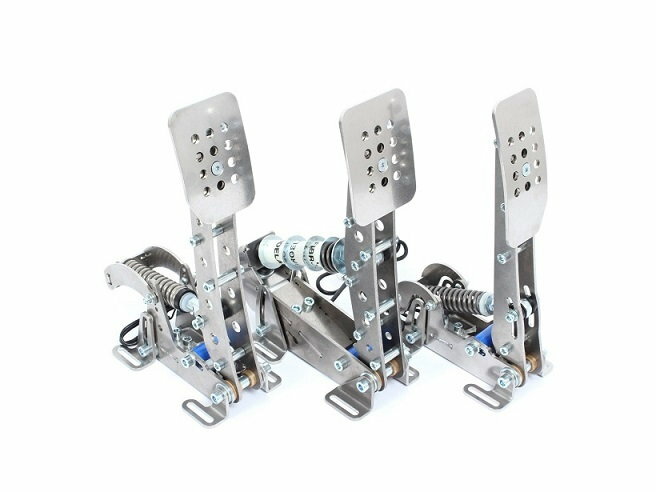 On the pedals, while I wait for HE Sprints to come back into stock, do you all have a suggestion of something load cell based that I can get some money back out of? I guess I could go the Fanatec route for now. Any suggestions would be great. All I can say at this point is, thank God I am not single! This new sim racing rig adventure is quite the talk of the ladies at Children's National in DC where my Real Boss works. ROFLs. It doesn't really matter because they are out of stock! Yeah, I am waiting for their pedals to come back into stock. Any suggestions while I wait? If you want to upgrade the G27 in the interim, there is a progressive brake spring called GTeye on eBay for around $25 that will improve the brake feel quite a bit. Is it a miracle worker? No. Does it help? Yes, quite a bit. Is it a pain to install? Not really, mostly easy, but just need to be careful of not stressing the tiny internal wires when you are separating the pedal case. If you want to buy something new in the interim, then you could buy Fanatec V3 pedals (non-inverted) for $329 and flip them on eBay when done. The Fanatec V3's work fine with the G27 wheel. Fanatec retains a lot of value, so you will get most of your money back on eBay when you are done with them. Shipping from UK for Fanatec is always a little pricey on the initial purchase, so you won't get that back. The Fanatec V3 pedals aren't as huge an upgrade over a (GTeye-modded) G27 pedal set as you would think, but If you order the Fanatec V3 brake performance kit (for something like $29), it makes the Fanatec V3's perform much better. The V3 brake performance kit is a "must have" in my opinion given the modest price and significant performance increase, and it isn't very difficult to install. Fanatec also sells an external damper that can be added to the brake, which I haven't tried, but I think the brake performance kit is very good (it seemed like many felt the performance kit was better than the damper when I researched it online before ordering the performance kit). Great advice. Looks like I might have a set of HE pros coming my way from somebody on the iracing forum. Can always order the sprints when they finally come back into stock and resell the pros. The sprint is only slightly less comfortable compared to the sport seat. Both are wide/large versions. Also, sprint can be had in blue. But, maybe the sport one is the way to go since I am not doing a motion rig. Are the HE "Pros" the same as the "Ultimate"? 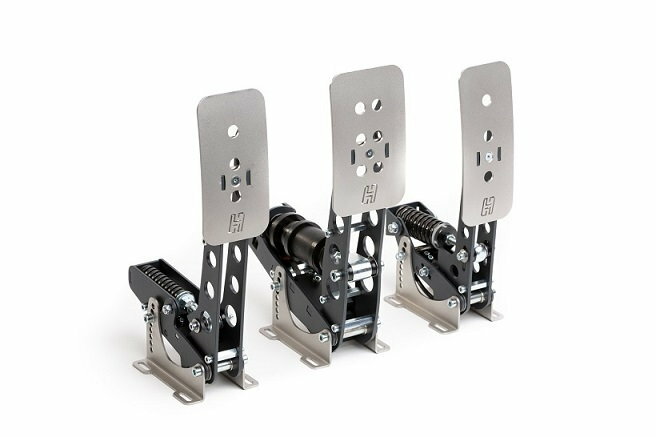 I only see "Ultimate" listed on their site for pedals, but they seem to use the Pro term sometimes for the clutch add-on and and baseplate. Do you prefer the Sprint over the Ultimate, or is it just cost? I'd love to hear more about the differences between the Sprint and the Ultimate/Pro if anybody can shed more light. Both look nice. I think having the ability to recline is better than no recline, so I favor the "chrono road" over the "sprint". In theory, the solid Sprint would be more rigid than the reclining road version, but since the G forces are virtual, I don't think the solid seat is much of an advantage in practice. On the "chrono road" page -- they have options of "black" and "vinyl black" -- not sure what the difference is. Is the "black" leather? Both versions of black have the same price but different part numbers. I think the Pros are the discontinued model that was replaced by the sprints. https://heusinkveld.com/products/sim...v=7516fd43adaa Side by side, I just like the construction of the sprints, and I think the sprints come with additional software. I decided to forgo the ones for sale on the iracing forum and wait for the sprints to come into stock. Here are photos with pros on the top and sprints on the bottom. This selection guide helped me out. The sprints seem like the ones for me: https://heusinkveld.com/support/peda...v=7516fd43adaa. And, the ultimate are quite a bit more expensive. The March stock update says the same thing as last time, that they are making as quickly as they can. So, I guess I will just monitor their website. On the seat, I sort of agree with you. I think the regular black is leather. I will probably order that in a few days, once I confirm the dimensions as Mark helpfully mentioned. Hopefully I get some form of build indication from Sim Lab. When I ordered, I just got an order number, but no email. And, I honestly can't remember if I game them an email. The original LED matrix itself is no longer available, but I found something on Amazon. If that works, I will let you guys know. ISide by side, I just like the construction of the sprints, and I think the sprints come with additional software. I decided to forgo the ones for sale on the iracing forum and wait for the sprints to come into stock. Here are photos with pros on the top and sprints on the bottom. This selection guide helped me out. The sprints seem like the ones for me: https://heusinkveld.com/support/peda...v=7516fd43adaa. And, the ultimate are quite a bit more expensive. Wow, great information! I usually "buy once" by getting the best available, but after reading the guide, I agree that the Sprint pedals are a better match. Thanks for info -- I probably would have ordered the Ultimates without reading that guide. All good brother. Are you checking the HE website religiously? Maybe between the two of us we might stumble on some stock. I'll PM you my cell number and you can text me if you stumble on them and I can do the same. I figured I would also lay out my expected costs for this rig, since many ask about that. Keep in mind, this is a medium-high setup. Watkins Glen tonight. good luck everyone.